In this lesson, students will learn about basket making through the Pomo basket weaver Corine Pearce in the CALIFORNIA episode. Students will inspect and analyze the materials and functions of a wide variety of baskets. They will learn about the practical and ceremonial importance of baskets and basket making to people living in communities around the world and over time. Students will consider how people traditionally create baskets with materials available to them in their natural environment, how materials often influence the forms of the baskets made, and how materials used to make baskets can convey meaning. Students also will learn that basket makers sometimes work with alternative materials– materials that are made by humans rather than found in nature. Students will engage in the process of basket making, making decisions about their basket’s function, the materials they will use, and the basket making techniques they will employ. With support from the instructor, students will determine materials to which they have access and prepare those materials for weaving. Working individually or in small groups, students will construct a woven basket and evaluate how successful the basket is for the practical or ceremonial purpose it was created. I like to teach basketry because it connects us all as humans…I realized, it doesn’t matter what tribe on the planet you are from, you all still made baskets. Everyone already has a basket in them, and I am just helping them bring it out. Corine Pearce is a Pomo basket weaver from Redwood Valley, CA. Throughout the history of the Pomo people, baskets were the essential tool of life and Pomo baskets are among the best in the world by fact of their sheer technical virtuosity. Corine has dedicated her life to sharing her specialized knowledge and abilities with people throughout the world as well as by teaching her community at the Redwood Valley Education Center. Around the world and throughout time, people have used baskets to store and transport food and other goods, to mark important life events, to symbolize significant meanings in celebrations and ceremonies, and for commercial trade. People traditionally create baskets from materials found in their local environment. Basket making traditions vary from place to place depending upon available materials and the specific functions that baskets serve within the community. Basket forms, as well as their materials, patterns and designs, hold meaning and cultural significance. Why do people make and use baskets? How do the forms, materials and techniques used in basket making connect to the time and place in which baskets are made? How do baskets convey meaning? Understand how and why people have made and used baskets throughout the world and over time. Consider how baskets are used in their daily lives. Compare and contrast the form, materials, basket making techniques, decorative features and possible functions of selected baskets. Speculate about artistic, geographical and cultural origins of baskets, supported by description and analysis of the form, materials, techniques, decorative features, and possible functions of selected baskets. Create a basket intended for a practical or ceremonial function, using materials gathered and prepared for basket weaving. Environmental Science: Collaboration with Environmental Science teachers can bring further depth into the study of basketry. Science classes can harvest and investigate properties of the natural resources in the local environment that might be used as “stakes” or “weavers” in basketry. Science classes can also consider materials in the environment that could be repurposed rather than going to the landfill if used in this art making process. Students may want to learn more about the connection between the environment and harvesting materials for traditional basket making. 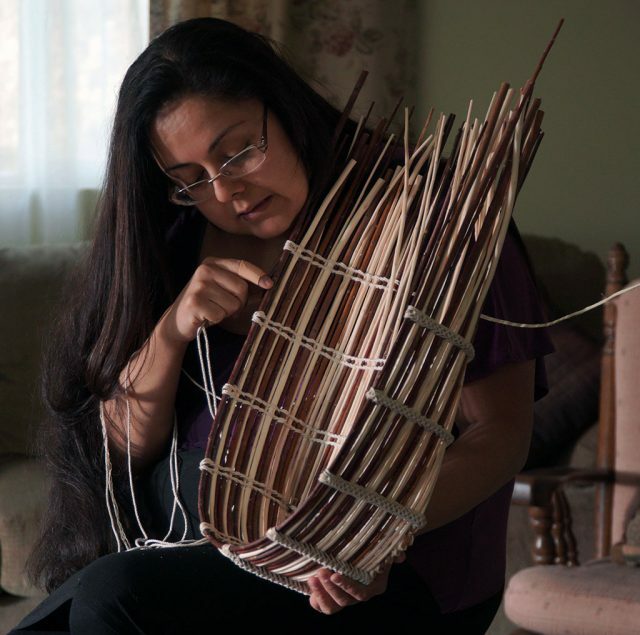 See the article, Addressing the Threats Facing Traditional Basketmaking Materials on the American Craft Council website, craftcouncil.org/post/addressing-threats-facing-traditional-basketmaking-materials which refers to Craft in America artist, Mary Jackson, and her efforts to preserve sweetgrass. History/Social Studies: Students may investigate the history of basketry within their own geographical region, addressing such questions as, “What cultural groups made and used baskets in this region?” “What purposes did baskets serve?” Students also may seek information about how the basket forms, materials and functions are related to the geography and cultural traditions of the region. See the documentary, “A Measure of Earth” on the National Basketry Organization website, nationalbasketry.org/a-measure-of-the-earth-2 for its focus on basketmakers from several different regions of the country and how they use materials found in their geographical regions. Teachers may wish to emphasize these same questions with regard to contemporary life in the region, noting that many of the functions originally served by baskets are now served by objects made from materials such as plastic. At the same time, however, we find baskets in homes, stores, and other places in our contemporary world. Teachers might have students consider why we still find baskets in our world today and what purposes baskets serve in contemporary life. For example, baskets are often sold as tourist items, used as decoration, or collected as beautiful objects. They may still be used for storage and transportation, but the items stored and transported may be different from items held in baskets in the past. Some baskets are handcrafted, such as those shown in the video, while other contemporary baskets are made by machine. Basket making traditions travel with people as they move from one part of the world to another. Basket makers may need to adapt basket making when traditional materials are not available. The sweetgrass basket making tradition in North Carolina, for example, has its origins in the communities on the West Coast of Africa. Enslaved people from the West Coast of Africa continued their basket making tradition using the grasses they found in the Low Country of South Carolina. The Craft in America segment about Mary Jackson, a contemporary sweetgrass basket maker, references the history of this basket making tradition www.craftinamerica.org/shorts/mary-jackson-segment. Anchor Standard #1. CREATING: Generate and conceptualize artistic ideas and work. Anchor Standard #8. RESPONDING: Interpret intent and meaning in artistic work. Anchor Standard #10. CONNECTING: Synthesize and relate knowledge and personal experiences to make art. Anchor Standard #11. CONNECTING: Relate artistic ideas and works with societal, cultural and historical context to deepen understanding. Collection of baskets from thrift shops or borrowed from community members that can be handled and inspected closely by students. The goal here is to have a diverse group of baskets that serve several different functions. Some examples used for everyday functions include picnic, laundry, bicycle, fishing, shopping, fruit, egg, and gathering baskets. Some baskets have special or ceremonial functions. An Easter basket is an example of such a basket. Other examples include Navajo wedding baskets and the ceremonial basket hats and caps of the Native people of the Pacific Northwest. Stakes and Weavers – two weights of weaving materials. Stakes are a heavier weight used to form the structure of the basket. Weavers are lighter weight materials woven over and under the stakes or coiled around the stake material. Traditional, school-grade materials for weaving baskets consisting of cane, reed, sweetgrass, rattan, raffia palm, and straw. Alternative materials such as plastic bags, zip-ties, string, malleable wire, old VHS or audio tapes, and any other materials found in the students’ environment that could serve as strands or structural supports for basket weaving. Natural materials to be collected by students on school grounds or from home. Thin branches, long grasses, vines, corn husks. Buckets or basins of water to soften materials, if necessary. Strong scissors, side cutters, round-nosed pliers, and a bodkin or a strong knitting needle. Work gloves, which are especially useful when preparing natural materials. Before viewing the segment on Corine Pearce and Pomo basket making, students will use the worksheet, Examining Basketry, as they sort baskets, make and generate questions about their materials and functions. As they view the video segment, students will pay special attention to the ways in which their questions are addressed. Finally, they will consider the broader questions about why people make and use baskets, how the environment contributes to the materials of a basket, and how baskets might convey meaning. After viewing the video and participating in a discussion, students will create their own baskets. They will consider basket making materials that are available to them. Using the worksheet Meaning in Materials, students will think about the implications those materials might have on the meaning of the basket they create, as well as determine a purpose for the basket they will make. Later, during studio time, students will create either a communal basket or individual baskets with materials connected to their contemporary environment and needs. Show students a handmade basket and engage them in a discussion. What is this? How do you know? Do you have baskets of your own or in your family? How do you or other members of your family use baskets? Have you ever made a basket? If so, how did you make it? What do you know about the history of baskets? How do you think baskets have been used in different parts of the world and throughout history? Provide students with a variety of actual baskets and images of baskets. Utilize the Craft in America image gallery provided for this lesson as well as acquired classroom examples. Have students inspect the baskets and prompt them to consider the questions found on the worksheet, Examining Basketry. Students may work alone, in pairs, or in small groups to complete the worksheet. Have students sort the baskets and compare and contrast them according to form, possible function, or materials. As students investigate the forms, materials, and possible functions of the baskets they should speculate about their artistic, geographical and cultural origins. At the completion of the worksheet students will have created a list of questions to be used while watching the video. After students complete the worksheet, Examining Basketry, explain that they will view a segment of the Craft in America episode, CALIFORNIA. Tell students that the entire video focuses on craft artists and craft traditions in the state of California. The segment that they will see features a member of the Pomo people who are indigenous people of Northern California. The Pomo people are regarded as some of the world’s finest basket makers. Pomo baskets are known for their beauty and for their exquisite craftsmanship. Pomo basket makers are both men and women, but the video features a woman, Corine Pearce. Ms. Pearce shares her own story of becoming a basket maker, and she also shares with us the process involved in creating baskets. Post these questions on the board or chart paper and review them with the students prior to viewing the video. Begin a discussion of the video. Have students refer to the questions they generated after examining and sorting baskets. For each question, ask students to share what they learned through watching the video. What did you find especially interesting? What are the steps in the process of making a Pomo basket? What part of the process in the creation of the baskets did you find most intriguing? What do you recall are key aspects of basket making for the Pomo people? How does the environment support the process of basket making for the Pomo basket makers? In what ways does the environment control or limit the process? Optional: Teachers might opt to provide the above questions for students to address in their sketchbooks as an overnight assignment. This works well with high school. After students answer the questions on their own and bring them to class, have them open their sketchbooks for their classmates to read. A shared electronic document also can be posted by teacher and students can contribute their answers. This helps preserve time for studio work. Remind students that they will create their own baskets. Clarify the choices that students will be expected to make. They will need to make choices about the basket’s purpose, the materials they will use, and the basket’s form. Explain that these decisions are interrelated. The purpose of the basket is connected to its form. The materials used are also connected to both purpose and form. Explain that they will need to choose whether they will create a basket for their own personal use or for a communal use. Finally, they will need to decide if they will work individually or with others to create a basket. Remind students that around the world and throughout time baskets have fulfilled needs of people living in communities. People have used baskets to store seeds, gather eggs, transport apples and even babies. Ask students: What purpose might your basket serve your class community or you personally? Could it be storage for personal devices? Would you prefer to create a basket that will provide storage for a personal item? Could it hold or transport snacks for class events? Would you want to create a basket that serves an everyday function for the classroom? What special occasions or important life events could be marked with this basket? As students come up with various needs a basket could fulfill, record them on the board or chart paper. Remind students that they will need to choose materials for their baskets. What kind of materials do students have available to them? What is in their environment? Included in a student’s environment could be the art room supply closet, home, local stores, exterior man-made areas, or out in nature. What alternative materials found in their environment, such as plastics or paper, could be prepared into strands for weaving? Give students time to reflect on their own and make notes on the worksheet, Meaning in Materials. Then using the information they gathered on the worksheet have students contribute to a shared list of ideas about materials. Remind students that they will need to make choices about the shape or form of their baskets. Have students make sketches of ideas for the shape of the basket they would like to create on the back of the worksheet or in a sketchbook. Beginning with the decisions made by the class on the worksheets, have students prepare the materials and determine if they will create a class basket/s or individual personal baskets. Students will need to figure out how each material is to be prepped for weaving. Traditional basket weaving supplies may need to be soaked in water to allow for more malleability and control of the form. Plastics may need to be cut into strips. Papers may need to be twisted or rolled into long lengths. Materials found in nature may need to be dried or stripped of extraneous parts to create smooth strands. This is all part of the planning and should be student directed where age appropriate. For younger grades much of this work may need to be completed by the teacher. Stakes and weavers should be determined. Remember that the stakes are the stronger, stiffer materials and the weavers are softer and can moved through and around the stakes. Really, by the time you sit down and start weaving, you are almost finished. When baskets are completed, have the students put their baskets to use. Suggest that they place the items for which the basket was intended into their basket. Recommend that they actually carry the full basket from one place to another. If a communal basket was made have students use the basket together for its purpose. In discussion or through a sketchbook reflection have students answer the following questions: How did it feel to use the basket? What aspects of the basket function well? What aspects of the basket do not function as expected? What words come to mind when you think about the materials you chose? Ask students to think about how their completed basket is similar to and different from the many baskets they have seen and thought about during this lesson. Encourage students to share with one or more classmates how they decided upon the function, materials and form of the basket they made. As a part of that conversation, suggest that they ask their classmate(s) to examine their baskets and share what meaning comes through to them. Remind students to consider if they were to make another basket, what would they do differently, what would they keep the same? Connected their own work to the tradition of basket making. Articulated local materials and resources that could be used for basket making. Understand specific functions that baskets serve within a community. Are able to explain how their basket holds meaning and tells about the basket’s artistic, geographical, and cultural origins. The Educators Guide for CALIFORNIA was developed under the direction of Dr. Marilyn Stewart, Professor Emerita of Art Education, Kutztown University of Pennsylvania, Kutztown, PA. Purpose and Planning is co-authored by Dolores E. Eaton and Marilyn Stewart, August, 2018.